I love my Daddy so much. I had so many occasions this weekend to pinch myself. Even though I’ve known my Daddy my entire 31 years, I still can’t believe that, of all the fathers with whom I might have found myself, I got him: the sweetest, most generous, good-hearted, funny, and fun-loving Daddy I could ever imagine. I just adore him. He was delayed getting here on Friday because of some drama at LAX (thankfully, nothing threatening, just a few unfortunate traffic collisions that spooked everyone). 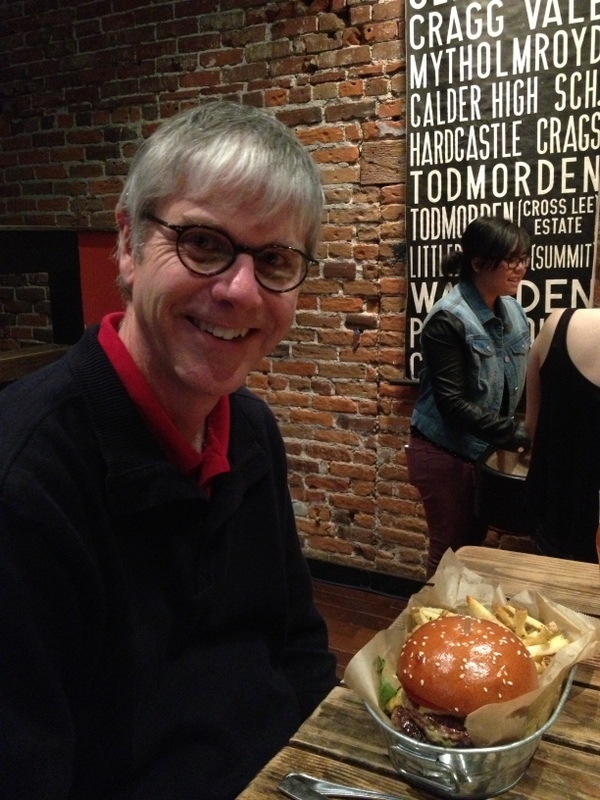 This is how fabulous my dad is: when he comes here, he rents a car. He actually doesn’t mind driving the almost-hour to our house from the airport, and he doesn’t want us to be without a car while he goes to the auto show. I told you, he’s so generous. And selfless. 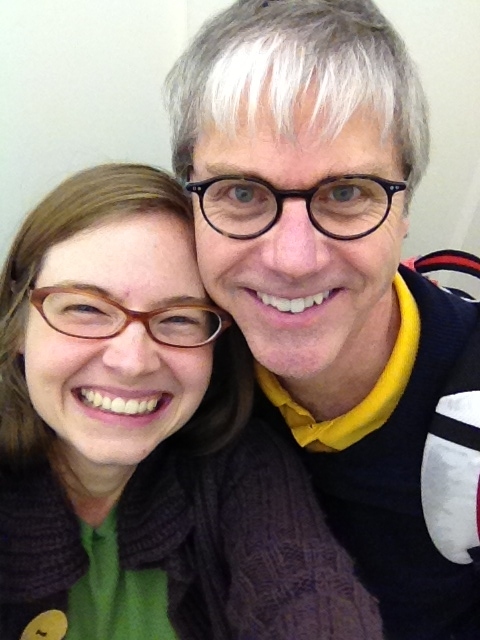 Anyway, when he finally got here, I was so excited I took a picture of us in the elevator on the way up. Three cheers for Daddy! We stayed up for a while talking and plotting our adventures. I told him about my Big Plan for the weekend: to get a Christmas tree! My dad loves Christmas, and it’s been so many years since we got to decorate a tree together, so I knew he would love it. I’d been calling the hardware store all week, asking if they had trees yet. Finally, they did! When we pulled up, all we saw were little Christmas topiaries in pots, and I got very nervous… Surely that was not what they meant by Christmas trees?! Thankfully, we found them! 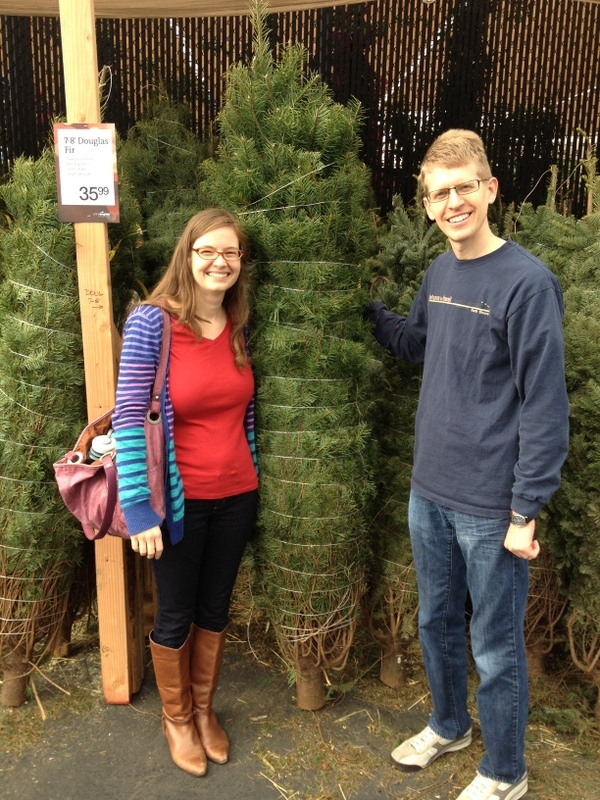 And ours was the first tree they had sold this year! I know some people like to hold off on trees until after Thanksgiving, and I totally respect that (who wants to cut short the season of pumpkins and pretty leaves?) But this works for us for a couple of reasons. I feel totally justified by Thanksgiving being so late this year, and a scientist told me that if you’re buying a live tree, it’s best to buy it as early as possible so that you can get it in water. That is my favorite piece of scientific data ever. Finally, Eric and I usually head home for the holidays in advance of Christmas, so it makes sense to get a tree early so we can enjoy it to the fullest. 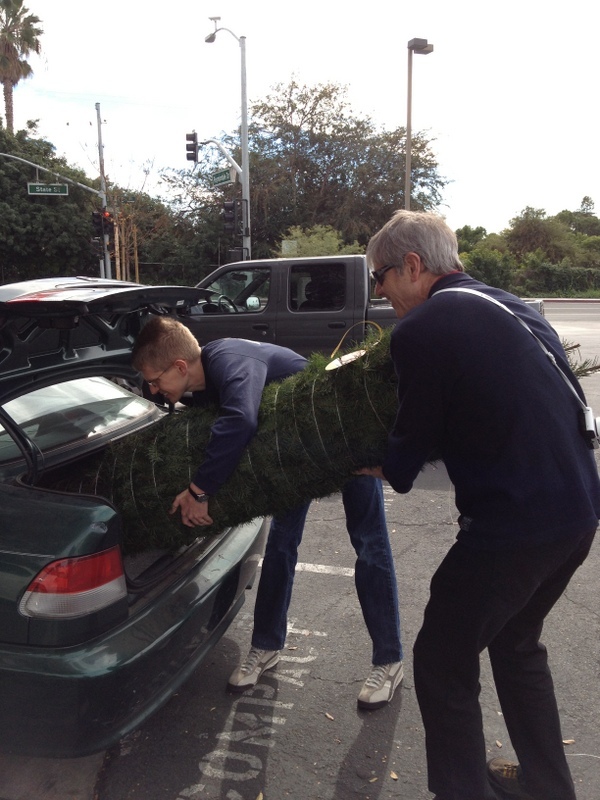 Daddy helped us get it loaded in the car, and it was much smoother than when Eric is stuck with me as a Christmas tree assistant. We got it onto the tree stand, and then it was time for lunch! 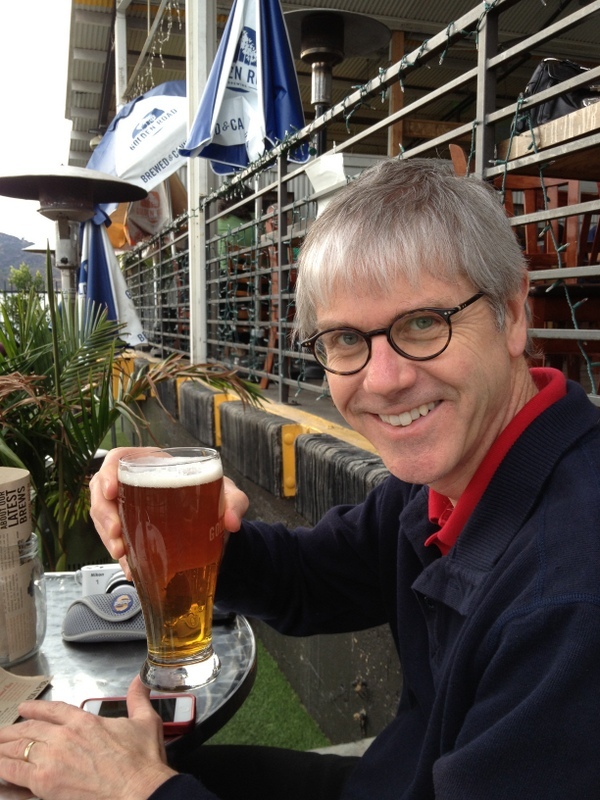 We took Daddy to Golden Road Brewery, where we knew he could get a good IPA. He loves to try new ones. The weather was warm enough to sit outside, and the sun even came out. Not bad for the end of November! I think he has the most beautiful smile. 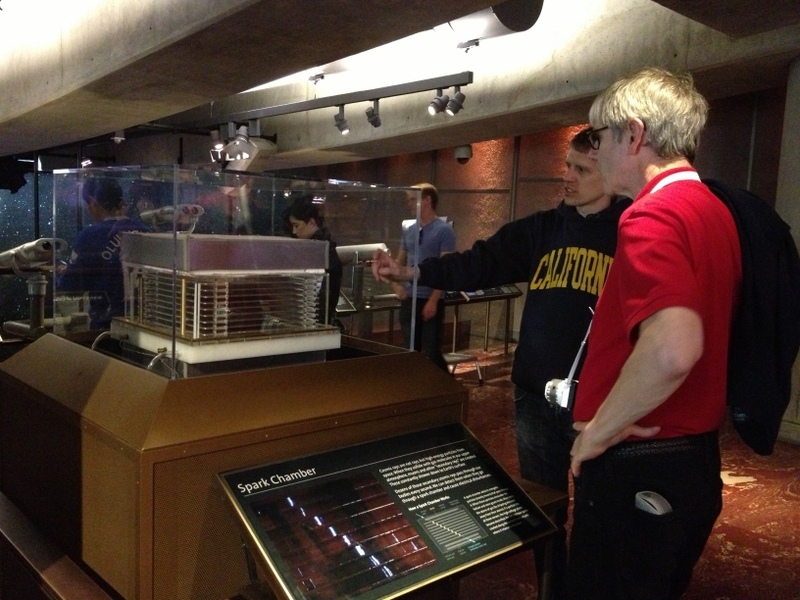 This is Eric explaining the finer points of the spark chamber to dad. Two scientists in their natural habitat. Adorable. 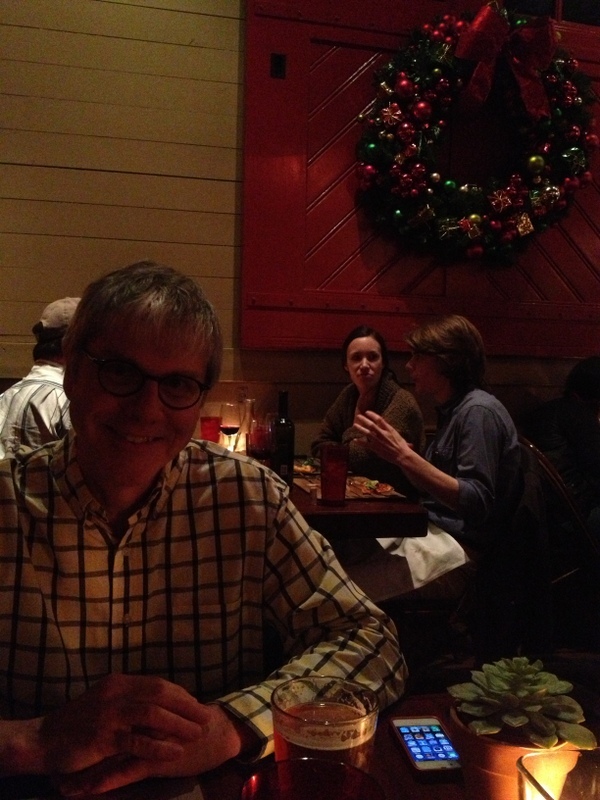 After a tree-lighting session, we went to Old Town for dinner. 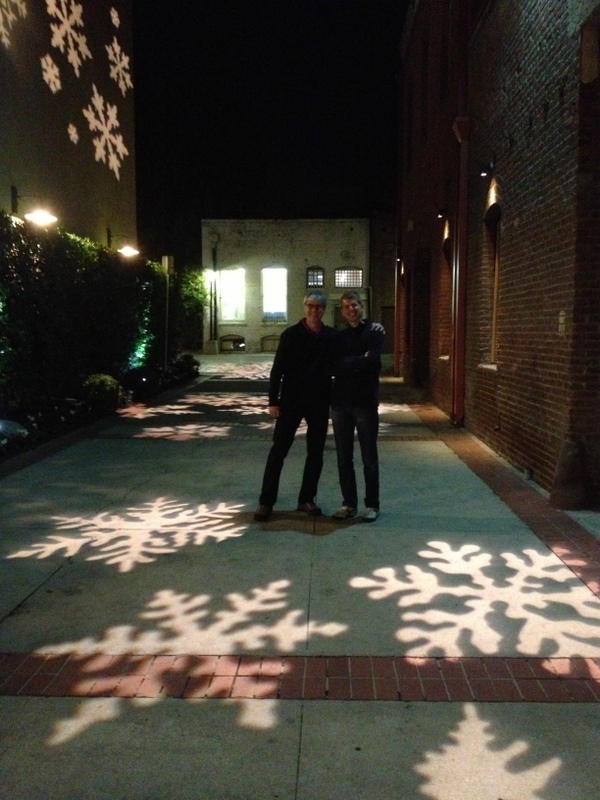 I was so excited that they already had the snowflakes projected! Kingsrow has the best fries in town. And I kind of like it that they serve them to you in a trough. And I kind of ate too many of them. On Sunday morning Daddy went to the auto show while we slept in. When he got back, I showed him how I was calculating something with algebra, and Eric got so excited he took pictures. Hilarious! My dad taught us algebra when we were about 5 years old, so I hope it does him proud that I can still remember a tiny bit of it. 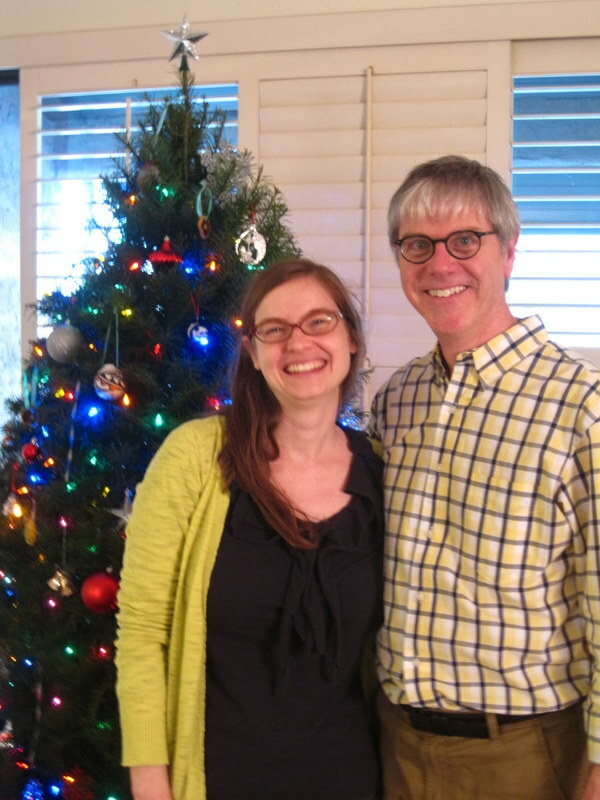 It was around this time that we started to notice that the Christmas tree was…leaning. To the left. And then the right. And then too far forward. Dad and Eric worked on it for a long time, and eventually dad crawled down to the base and cut off the branches that were keeping the tree from sitting in the stand. With an old bread knife. He is the best! 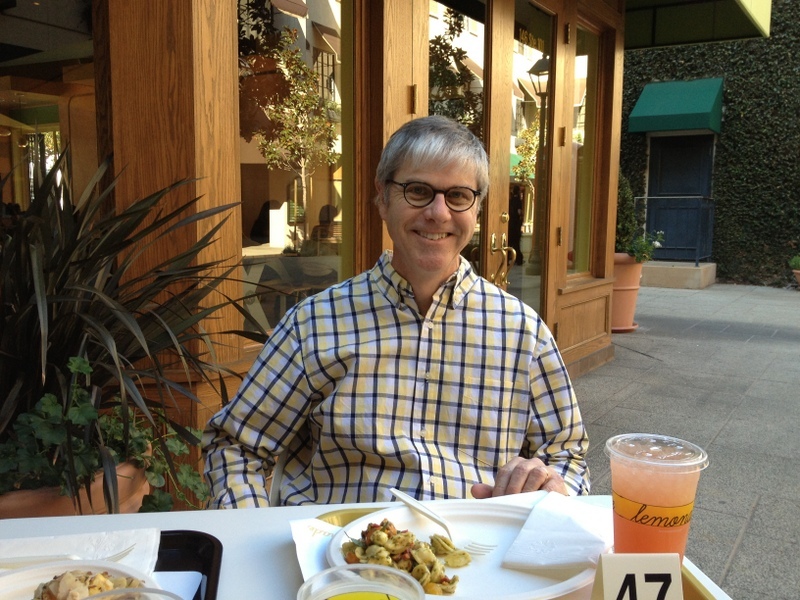 We walked to lunch at Lemonade, one of our favorite local spots, and then had a holiday stroll through Williams-Sonoma. Free mulled cider for all! 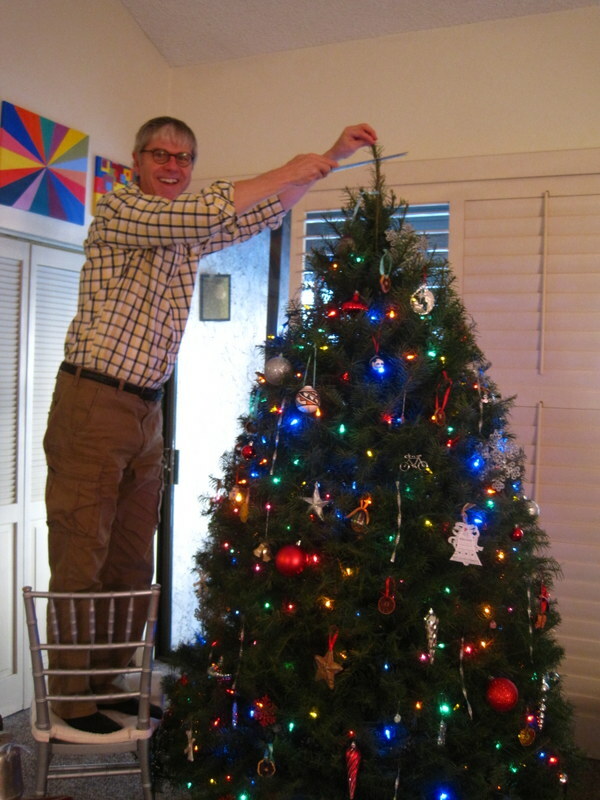 In the afternoon we got all the ornaments on the tree, and Daddy trimmed the top (with that same old bread knife!) 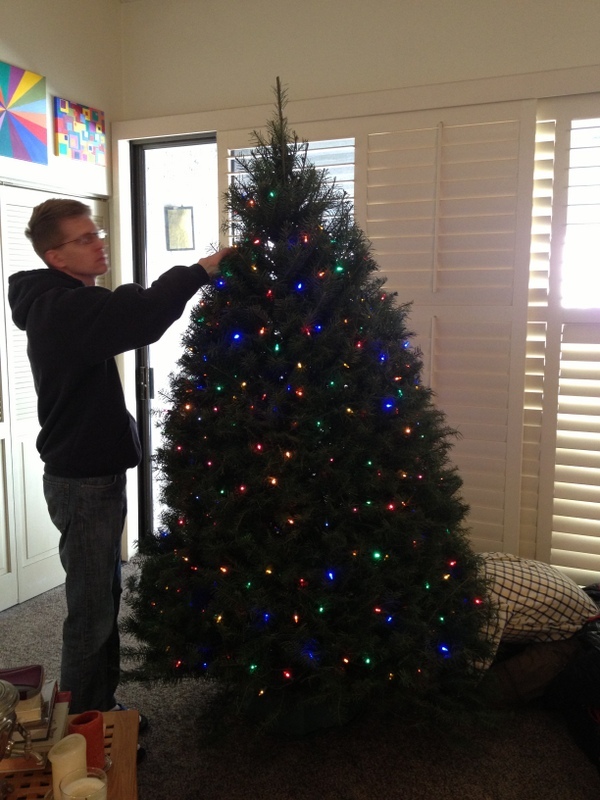 to put the star on. Hurray! Christmas magic! My dad has been writing about Christmas, when he was a child and when we were children, on his blog these past few weeks, so it felt super special to have a new Christmas memory. I think my face is blurry because I’m smiling too much to hold still. 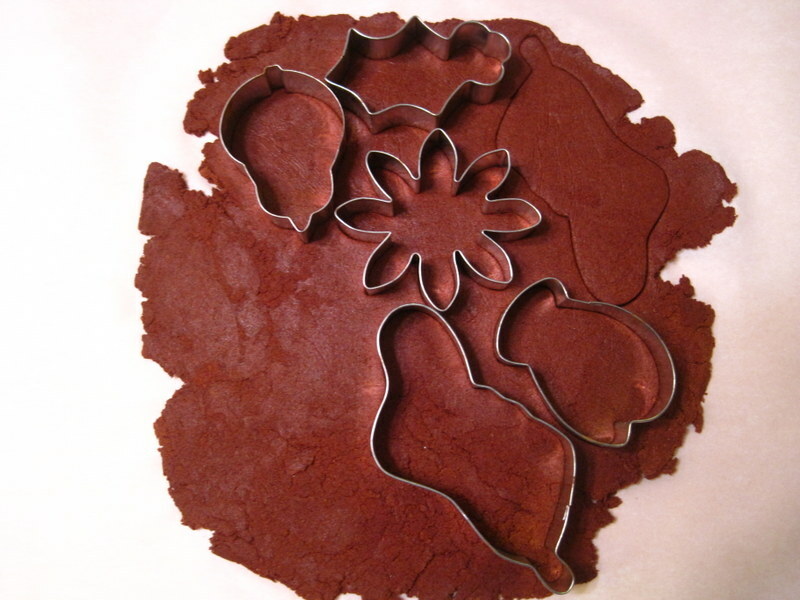 Once we were finished with the tree, my dad helped me make cinnamon Christmas ornaments. I am saving these for a separate post, but there are lots of hilarious/awesome pictures of the process. Daddy came to mass with us (and got to meet my friend Caren!) and then we went to a solid classic for dinner: The Luggage Room. 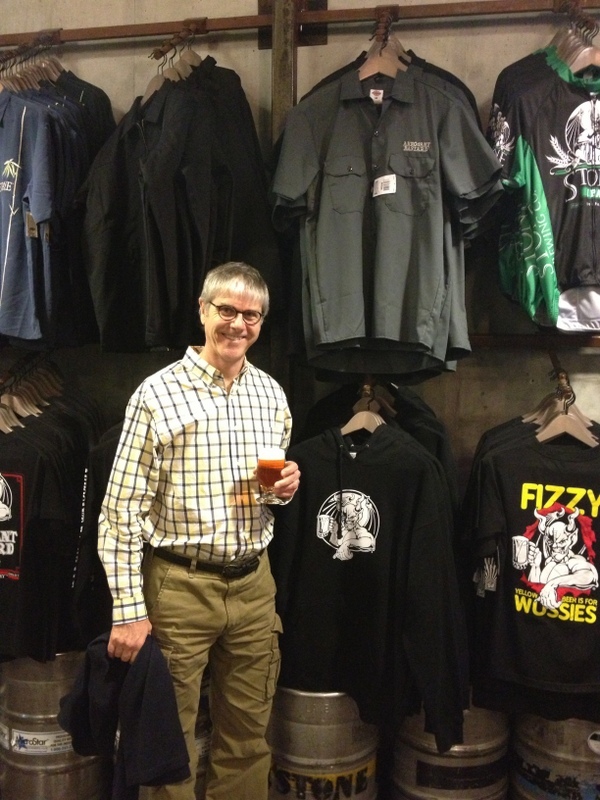 While we were waiting for a table, dad got to try an IPA at Stone Brewing across the courtyard. I know I have a picture of Daddy at The Luggage Room last year, so I wanted to include this one from this year. His phone is lit up because we were texting my mom. I know this is a long post, but that’s because I want to remember every little bit of it. 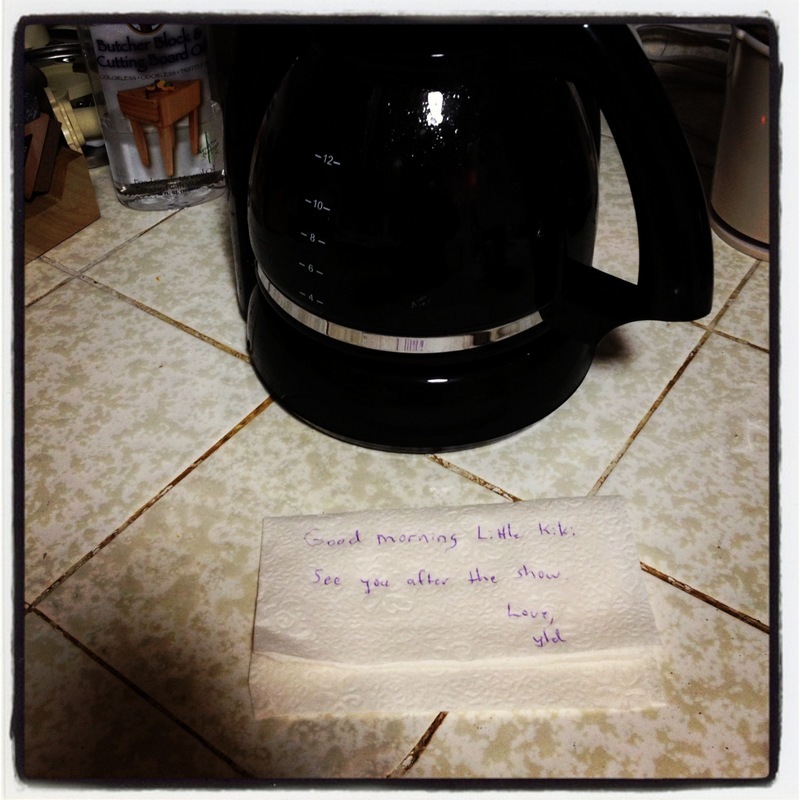 Including this note that Daddy left me by the coffee pot on Sunday morning. I totally cried when I emptied that coffee pot after he left. 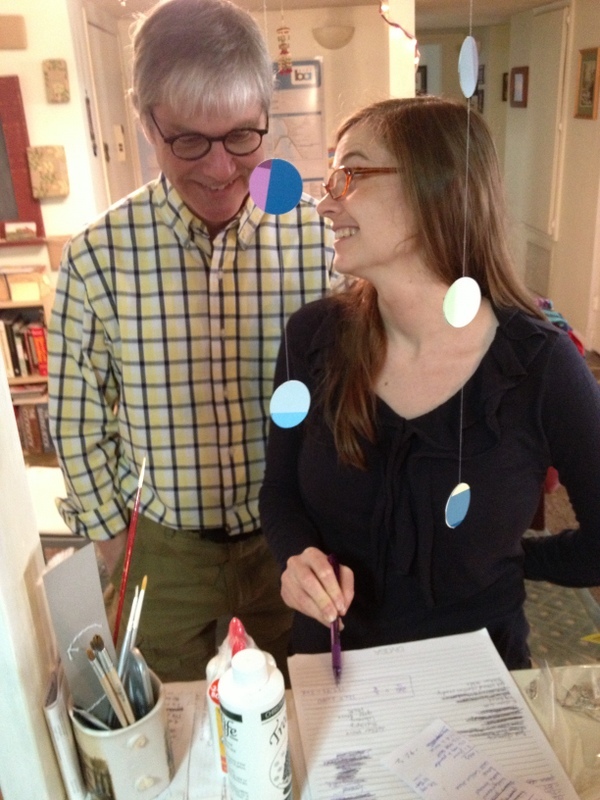 To be with my dad is to be in a beatific and wholly benevolent presence: he brings light and laughter and love and magic. I miss him so much already, and I am so thankful for this special time we had together this weekend. Unconditional love is a hard thing to wrap your mind around, but it’s always been something tangible for me because of my amazing parents. 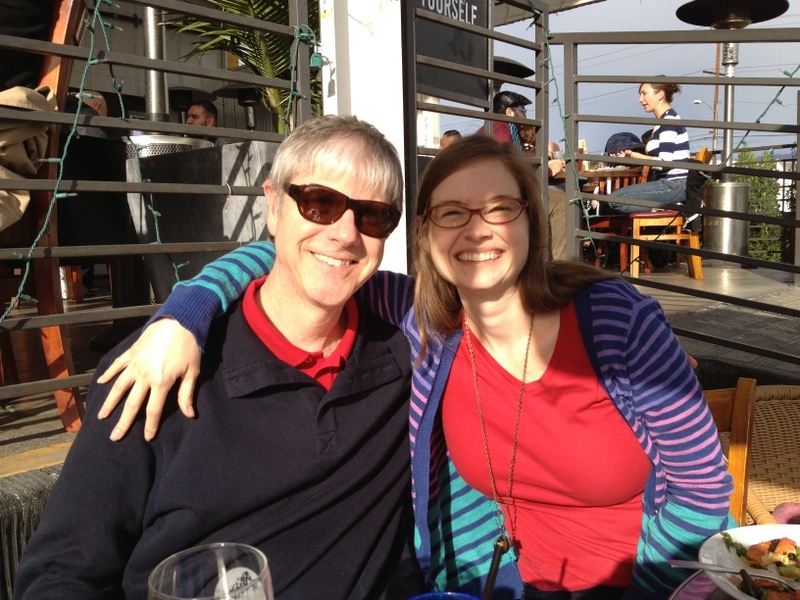 On Sunday night dad joined in our weekly phone call to Eric’s parents, and my mind was reeling with our good fortune and blessing: to have two sets of parents who love us, and each other, so fully and vibrantly and joyfully. I just could not ask for more, and I’ll be grateful for them every day for the rest of my life. And now I’m crying again. Love you, Daddy! You sure made the most of your weekend! What cute shots you got of your Dad! While I’m just at the beginnings of knowing your Dad, your description of him as wholly benevolent made me shake my head in agreement. This is so sweet:) And the same is certainly true of you! I am so lucky to have so many wholly benevolent men in my life! Thank you! I feel that way too. Sometimes I only get to something a few weeks after it happened, and I wonder if it’s too late to write about…but I am always so happy to have these things recorded for the future! Great times! I love the tree. Thanks! It’s fun to have it up! Indeed! I am pretty sure I couldn’t get the three to stand up straight on my own! I am humbled by your sweet tribute; I love you so much too! As I have said before, I couldn’t have dreamed of a more perfect daughter. It was an absolutely fabulous weekend and we should begin planning for LA Auto Show 2014. Yes, let’s do! I love you!! Imagine the state of the world if everyone had a parent/child relationship like yours?! Kings Row best fries? They have garlic fries?? Have y’all been up to the observatory on a clear nite? Never been to the Luggage Room – what’s good to order? I have a very recent pic of the Commons (Lemonade). I’ll share it on Fbk. What a sweet comment! I don’t think they had garlic fries on the menu, but maybe they used to have them? I think they recently made some changes. I definitely noticed a few new things. 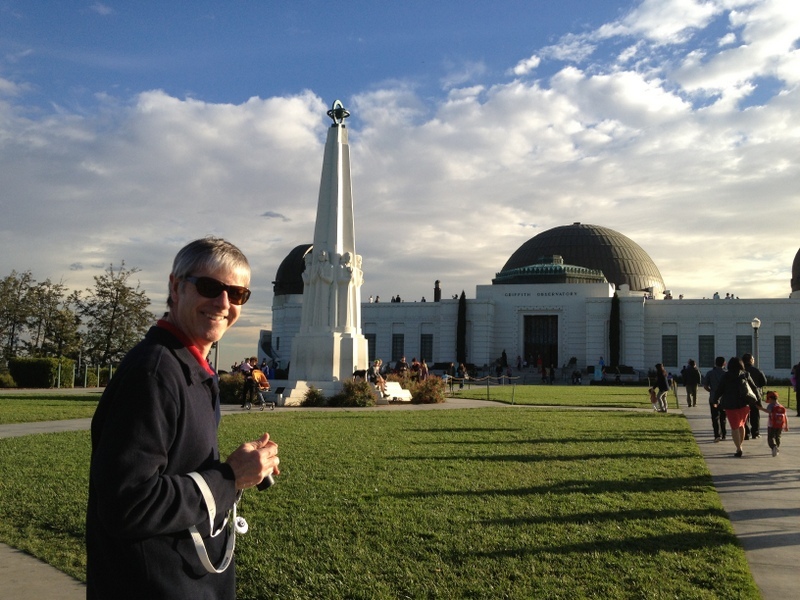 No, we still haven’t been to the observatory at night, but we should go! Oh, The Luggage Room is awesome, and all the more so because it actually used to be the luggage room of the train station–local history! It’s mostly a pizza place (I mean really really really good wood-fired pizza), but we have never ordered anything there that we didn’t like! My only complaint with the remodel of The Commons is that now there is no room for Williams-Sonoma’s gigantic Christmas tree! That was always a favorite of mine. Haha, yes, my post on my mom might be even longer–we’ll have to see! I hope you’re going to post how you make those cinnamon ornaments! Thank you so much! I am really lucky to have him 🙂 Yes, I will post the ornaments as soon as I have got them painted–hopefully I can finish this weekend! P.S. I just realized we were commenting on each other’s blogs at the same time….It would be so much simpler if we could just stroll on over to Cole.